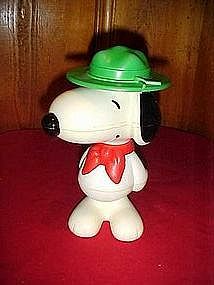 Vintage Snoopy puzzle toy. 5 pieces of Snoopy fit together when stacked over a large plastic center rod. Measures 9 1/2" tall Made by Hasbro. Would have been designed for preschool age children. Great condition. The only flaw I can see is where the old glue has yellowed at the seams. A great addition to your vintage Peanuts collection.